Surprisingly, my girlfriend bought me a pizza and i took a bite from, it was spicy, so creaming and somehow meaty. Guess what? My night was so fun filled cause my stomach just accepted an August visitor (smiles). 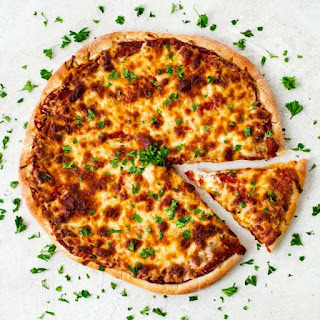 So, i decided to go online so as to know how to prepare home made pizza without going out to the eatery to get myself one. Here are the what you need to know about how to prepare home made pizza for yourself as well as for the whole family. 1. In the bowl of your stand mixer, which is fitted with a hook attachment, combine the yeast and warm water. Stir it around and let sit for 5 minutes until the yeast is foamy and dissolved. Start again with active yeast if the yeast doesn't dissolve. 2. Add flour, olive oil, salt, and sugar. Mix by hand or with the dough hook on low speed for 1 minute. 3. Knead for 7 minutes by hand or with your dough hook on low-medium speed, once all of the ingredients are mixed. If your dough is too wet, add up to 1/4 cup more flour. Your dough should be smooth and elastic, after kneading. Poke it with your finger - if it slowly bounces back, your dough is ready to rise. If not, keep kneading. Meanwhile, cook beef and onion over medium heat until no longer pink. 4. Mould the dough into the shape of a ball and place in a large mixing bowl that has been coated lightly with olive oil; ensure all sides are coated by turning it over. Cover tightly with plastic wrap and allow to rise in a warm environment (about 75F-80F). 5. Heat up your oven to 200F. Then, turn it off and keep the door slightly open. This will be a warm environment for your dough to rise. And after about 30 minutes, close the oven door to trap warmish air inside with the rising dough. 6. In about 1 - 2 hours your dough will have doubled in size. When this happens, punch the dough down to release the air and divide in half. Press each into a greased 12-in pizza pan. Combine the tomato sauce, oregano and basil; spread over each crust. Top with beef mixture, green pepper and cheese. 7. Bake at 400° for 25-30 minutes or until crust is lightly browned. Yield: 2 pizzas (3 servings each).